Firstly, I found that the instructions were obviously for an earlier model as they did not make sense and even the picture was different, making putting it up and down a little less straight forward. If you have short arms and/or a belly in the way (which is pretty much me at the moment, as I'm due in July!) then it is impossible to put up or down by yourself as you have to reach into the cot to press the middle down/pull up. The sides have 2 'hinges' but the instructions give the impression they only have one so collapsing it takes some technique but once you have figured it out it is quite simple. To fix the mattress to the bottom of the cot, the instructions give the impression that the hole to loop the velcro through is in one place when it is actually somewhere totally different and we almost didnt find it! Once assembled the cot is a very good size for a sleeping area and just big enough to use as a playpen for a small baby. It's reassuringly sturdy and very good looking too. It is light enough for a man to carry easily but would benefit from a shoulder strap to carry more easily. 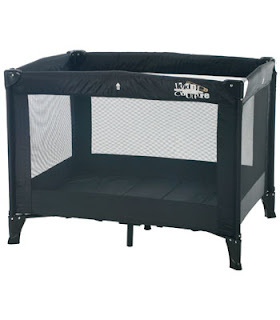 You are also given the impression that is is as easy as pushing down on the middle post to make the cot 'splay out' and lock into position but by pushing you just push the feet into the floor and the cot doesnt move, so you have to do some shaking and persuading until they legs get to a certain point then you can push down and lock the base.